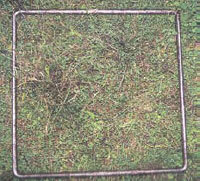 Measuring groundcover is easy. 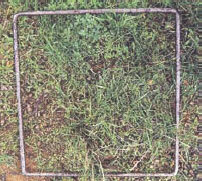 Either visualise a 50 cm by 50 cm square or make one out of wire. Stand over this area, look directly down onto the pasture and estimate the amount of ground that is covered by plants, litter and dung. Even without any training you will be reasonably close to the right number and photos may help improve your estimate. For each paddock, record groundcover at about 30 random locations, look at the variation (highest and lowest values) and calculate the average. You can also look for more visual signs of erosion and soil loss such as gullies, rills and tunnelling, washing of soil, dung and litter along fence lines and around plants, muddy and silted dams and muddy streams with high sediment loads. 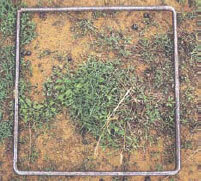 Monitor groundcover and grazing activity regularly to assess progress. You will be amazed how quickly you can make an impact. Be particularly careful in dry or drought periods. 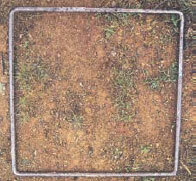 Select ‘sacrifice’ paddocks or construct containment areas for hand feeding, to retain groundcover or build it up in the rested paddocks over time.